*FULL* Free Canoeing Taster Session – come along & try it out! 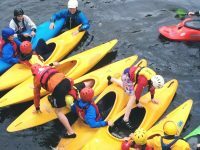 If you’re not sure about signing up for a full summer paddling course why not try a free taster session first? Came along to Halifax Canoe Club at 1.30pm, in Sowerby Bridge and have a go at canoeing. We’ll make it fun, you just need to come along to enjoy yourself! Want to sign up? You can either send an email to secretary@halifaxcanoe.org.uk (let us know how many people are coming and their ages please), or register at our sign up night at Hollins Mill pub in Sowerby Bridge on 26th March.